A lot of guys who come to my seminars and courses have found it hard to strike a balance between flirty and sleazy. They either end up holding back and seeming nervous (or worse, getting friend zoned) or going too far and embarrassing themselves. It’s a fine line, but I guarantee that you will not only overcome this distinction but also have fun doing it. 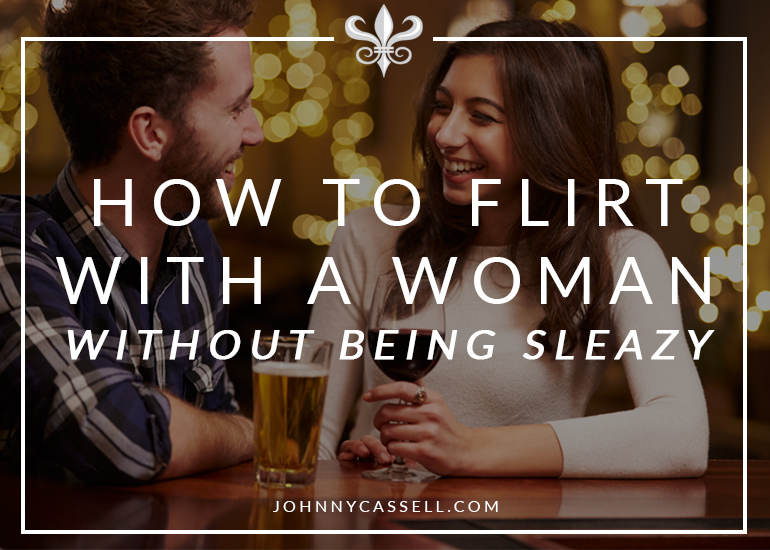 You won’t even need to think about how to flirt with a girl – it will come naturally if you are warm enough and confident enough. Flirting with girls is also not innately creepy. It is a statement of intent to let a girl know we think of her as a sexual being as well as an interesting person with whom to hang out. It’s also a clear sign that we’d like her to think of us the same way. To pretend to be a friend just to pounce later is far creepier. It’s a mix of reading the room and projecting confidence that will bolster your flirting skill set. Don’t grin to the point of unnerving them, but a calm, friendly smile will not only mentally prepare you for social interaction, it will also make the words you say clearer and make you more approachable and less threatening from the outset. You need to give off a sense of fun, and a smile is a simple and practical way to do that. Throwing a sexual quip her way with a gruff face just seems threatening. A smile from across the room is one of the easiest ways to flirt with a girl. You don’t want to launch straight into double entendres and eyebrow-raising sexual puns. Always read the conversation and let her nudge in that direction first. There has to be a constant awareness of her level of comfort in the conversation. If she seems uncomfortable, rein it in. The safer she feels around you, the flirtier she’ll become. If she starts giggling, lightly touching your knee and shoulder, and playing with her hair, you can probably start getting more suggestive. Move in gently and if she says no, back away and keep the conversation friendly without even registering the rejection. Keeping her comfortable is your main objective. Sleazy is going into the fray with a zillion prepared lines, quotes from movies, and terrible puns, and unabashedly firing them at any girl who’ll listen. It is the real life equivalent of spamming random girls with ‘hey bbz how u sxy’ in online dating, and will rarely get a response. Be genuinely interested in the women you speak to, and you won’t have to know how to flirt without being creepy. Ask open questions, let them respond, listen to their response and react to it, maybe by saying something flirty. Something slightly flirty that demonstrates listening is ten times stronger than saying something very sexual that’s awkwardly staged. That’s not the same as self-conscious. Don’t be over-concerned with what you’re doing. Just think about how you’re coming across. This includes noticing whether people are looking over at you or your general volume within the level of the room. Are you at her eye level, or towering over her? Good judgment of your position in your surroundings, and looking comfortable, is key to her feeling at ease. Make sure that you move in gradually instead of cramping her space all at once. Light touching or putting a hand at the base of her spine is all within limits, but keep a healthy perimeter and read her reactions before you move closer to her. This also applies to testing the boundaries of flirting. If she calls you out on it, make fun of yourself. Draw attention to it. “Oh, of course I’m flirting with you! Who on Earth wouldn’t?” Make your intent clear. Calm body language is crucial to helping a girl to feel relaxed around you. If you’re fiddling with your hair, fidgeting, or crossing your arms, you’re probably making her uncomfortable. When you do say something flirtatious, it’s going to seem off-colour and sleazy. The main step in how to not be a creep is getting your body language right. A creep is someone who scares other people. If you’re being called a creep, it’s because girls feel uncomfortable around you. Your body language is doing 85 percent of that. Relax. Pull your shoulders back and keep your back straight. Have your arms in an open gesture with your palms facing forward. More than thinking about any of that, though, just get into the conversation. When you ease into the flow of the dialogue, your body language will automatically correct itself. When you feel comfortable, she will. What drives body language is the narrative in your head. If you approach the situation with a negative narrative playing in your head, then that will project through your body language. Keeping an upbeat, can-do narrative going will make it easier to maintain the conversation without thinking about body language. Be nice to her. You went over to talk to her for a reason. Why not let her know what that reason was? Maybe you liked an item of clothing or thought she looked like she read a particular author you like. Tell her. Telling a woman she’s beautiful, or that something about her is beautiful, needn’t be sleazy if you mean it. Make her feel special. You don’t have to make someone uncomfortable by flirting. 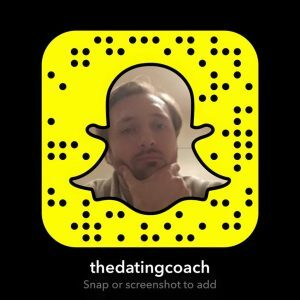 Join one of my seminars or courses here and see how I can improve your interactions with women today.